Last week Kevin was gone, so I invited my mom to come and help me redo our bedroom. 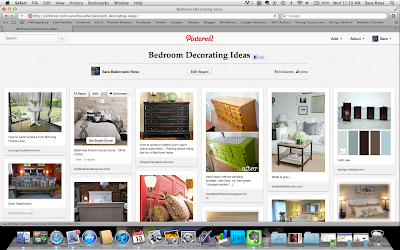 I have been pinning ideas to my Pinterest Bedroom Decorating Ideas board for awhile now. I really liked how some turned old doors into into headboards and thought that would be something different and easy to do. I just needed the old doors. Well, one day Kevin came home and told me that he just found eight old doors down at the “North Place” where they were doing some bulldozing work. I said great! He didn’t even know about the headboard idea, but when I told him about it he thought it sounded like a good idea too! As you can see in the pictures below, three of the walls were a medium beige color and the wall behind the bed was a steel blue color. Our furniture is a collection of mismatched pieces. They all seemed to be made out of the same MDF material and were all the same golden oak color. Also, the ceiling fan needed to be updated. It worked just fine, so I donated it (along with the hardware from the dressers) to our local Habitat for Humanity ReStore. The picture directly below is what you see when you walk into the bedroom. The other pictures show the rest of the bedroom from different angles. 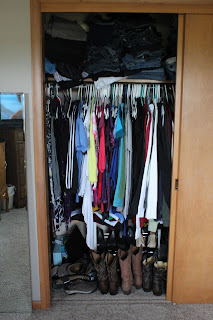 Kevin and I share a normal sized closet with sliding doors. 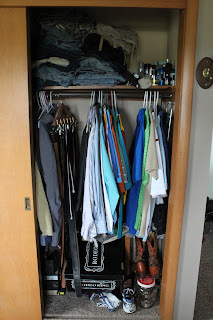 This was REALLY hard for me at first because before I married him and lived in my own house I had a big walk-in closet all to myself! Now I have a half of a small closet all to myself. But we make it work. 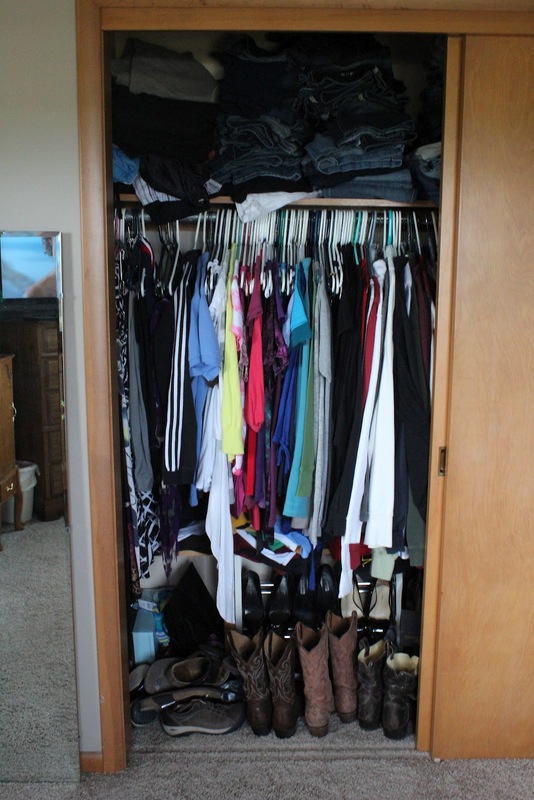 It’s obviously very messy and disorganized in the pictures below…. When it game to picking out the colors for the walls/ceiling and the furniture, I wanted it to look good with the carpet. The carpet in our room is the same as HD’s bedroom and the living room. We really like it and it was obviously going to stay. Since it was a warmer grey/beige color, I wanted to make sure the wall color wasn’t too cool of a grey. I ended up deciding on Grey Whisper from Dutch Boy for the walls and ceiling (the top square color above) and Little Black Dress for the furniture (the bottom color on the third strip over from the left above). Next was preparing the room to be painted. Since all the furniture was going to be painted over in the shop, I had to unload everything out of and off of them. I also had to take everything out of our closet. It all got piled up on the bed and those piles on the floor got moved into HD’s room for the week. Since Kevin was gone all week and my mom was visiting, I just slept on the couch for the next six nights. Once I got everything out, I just draped a large piece of plastic over the bed and the room was ready to go. Next step before painting was wiping down all the trim and taping around the baseboards and windows. Then it was on to the painting! -All the furniture is staying and will get painted black and then distressed (this includes two chests of drawers and two night stands). -All the curtain rods are staying as they are already a blackish color. -Most of the bedding is staying (sheets, blanket, pillows and comforter). -Replace ceiling fan (donate old one). -Buy new duvet cover to go over existing comforter and two matching pillow shams and a black bed skirt. -Buy new hardware for the furniture. -Buy material and make curtains to match the bedding. 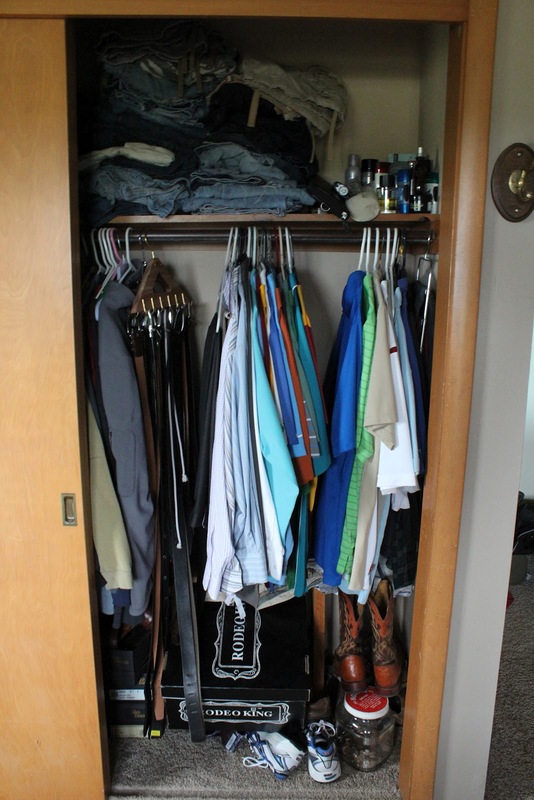 -Buy new shelving to make better use of the space in the closet. -Paint two free doors and turn them into a headboard for the bed. -Keep my eye out for two matching nightstands that I will paint and distress to match the rest of the furniture. Going to use the ones that we have now until then. So that’s what was on the agenda last week. Totally thought we could get most of it done then, but those two old doors had layers and layers of paint on them. My mom worked on those quite a bit, using stripper to take most of the paint off and then doing a lot of sanding on them. They were looking pretty good when she had to head home, but she took them with her to finish them there and to get them cut down so they are the same sizes. Stay tuned to see the work in progress! I wish I could come help you! This is right up my alley!